If you don’t already know, I work on art directing confined spaces and locations to their best potential use, and style them to suit a script/ character of a film or advertisement. The biggest challenge always is space division and the only thing that gets me thinking over and over and over again. I like to believe I have the space planning part nailed, though creating a great depth, function and connect of one area to the other by experimenting with newer options is what keeps me in check. While we can use different styles of screens, glass doors, furniture, drapes, lights, sculptures etc. to divide and define spaces; Glass Bead Curtains are on my hit list these days because I just LOVE the way they catch the light and glisten up like a perfect tease to a space. It is a pleasant layer that allows privacy yet a subtle disconnect. This week MMT introduces you to “Memories of A Butterfly “ by Sreeti Mondol who says that it is a simple and malleable concept – the bead curtain. One should note that all designs by MOAB are hand-made and every piece is customized so as to suite the clients’ design and functional needs! Sreeti surely has created an edge by exploring extensively, in style, material, dimensions and design. The variety of materials used includes– Pure Glass, Crystal, Australian Shell, Bone, Treated PVC, Stained or Sprayed Acrylic, Acrylic Crystal and Wood, just to name a few. You can work along MOAB to design a bead screen to your tastes or better, just pick from her creations to suit your space. 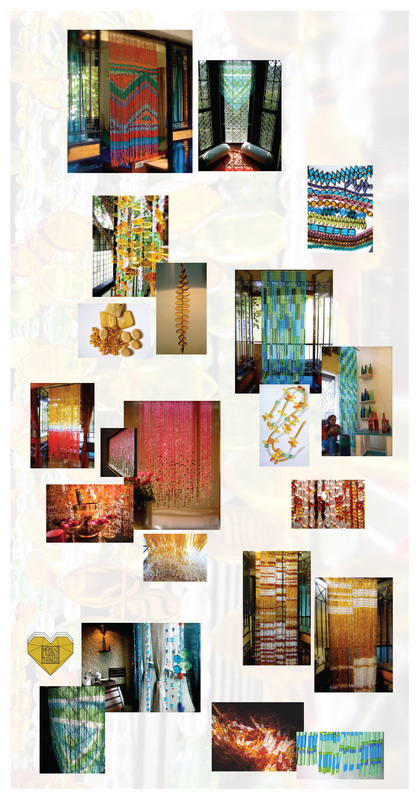 MMT’s favorite is the BlueGreen MOSAIC Glass Bead Curtain because of its intricate and modern design. Her other designs include, ‘Moroccan Blue’, ‘Bold Polka’, ‘Champagne Gold’, ‘Glass Crystal Multicolored’, ‘Pomegranate Gold’, ‘SeaBlueGreen Aztek’, ‘Topaz Leaf’, ‘Acrylic Crystal’s’ and ‘Chandelier Decor’. View much more and contact Sreeti Mondol – Director and Principal Designer for Memories of a Butterfly through her facebook page linked here and/or her website www.memoriesofabutterfly.com; having been at this for almost a decade, you can be sure to find the advise and help you need from Sreeti.